Bonneyville Mill – "The oldest, continuously operating grist mill in Indiana"
Built in 1837, Bonneyville Mill is designated by the Indiana State Historical Society as the oldest continuously operating grist mill in Indiana. 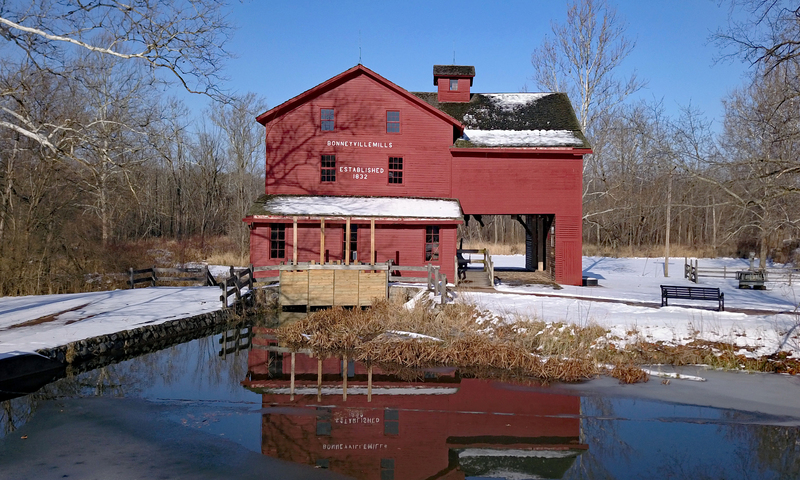 It is the most photographed and painted destination spot in Elkhart County and is located within the boundaries of Bonneyville Mill County Park. Edward Bonney came to the Bristol, Indiana area from New York State in 1833 hoping to establish a community or business center along the Little Elkhart River where lumber could be sawed and grain could be ground. One of the critical factors for the success of his venture was the routing of a canal through the area. However, the canal never came, certain debts were defaulted, and Edward Bonney was forced to look for other forms of income. In 1842 he was arrested for counterfeiting but appears to have escaped before his trial and fled west to Nauvoo, Illinois where the Mormons had settled before they moved to Salt Lake City, Utah. Eventually, Bonney worked his way toward Chicago and in 1863 enlisted in the 127th Illinois Infantry to fight for the Union Army in the American Civil War. His military duty, engaging his bounty hunting skills, was to locate and return soldiers who had deserted. He received a disability discharge in December, 1863 and died two months later in February, 1864. The story of Edward Bonney is told throughout the video. John Jenney, today’s Bonneyville Mill Manager, takes us on a tour of the river system and all four floors of the mill showing us up close how a mill works and how flour is made just as it was in the 1800’s using water powered grinding stones. Learn about the important role of the mill in the surrounding farming community. Filmed in all four seasons of the year, you will feel as though you are personally inside the mill, outside along the river, and among the flowers. Beautiful aerial scenes offer a perspective of the area from above that cannot be seen from the ground. Today, Bonneyville Mill is a picturesque destination that attracts photographers and visitors from all fifty states and many foreign countries. Powered by the river’s mill race corn meal, wheat flour, and buckwheat are still produced by the mill’s two grinding stones. Visitors can watch the old ways of how grain is reduced to flour and corn meal, and children can learn where their food comes from before it appears in the grocery store.